This Darley Dale heath is the first heather to gain The Heather Society’s new accolade, the Premier Award. 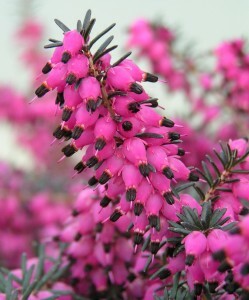 This innovative award is granted to a new heather cultivar showing outstanding attributes for general garden planting. Each plant is judged on flower colour, size and longevity, habit, suitability for a wide range of soil types, hardiness, and versatility in the garden. Erica × darleyensis ‘Lucie’ has magnificent, large, glowing magenta flowers from late autumn to spring. The blossoms are set against dark green foliage. ‘Lucie’ is vigorous and resistant to disease. ‘Lucie’ originated as a sport on ‘Kramers Rote’ (Kramer’s Red) at les Pépinières Renault, Gorron, France, in 1997. The new cultivar possesses all the qualities of its popular, well-known parent yet has larger flowers in broader spikes. ‘Lucie’, which is protected by plant breeders’ rights, is marketed by the French company SAPHO under the trade-mark WINTERBELLES® which includes several other recently introduced winter-flowering heathers. ‘Lucie’ is available from licenced growers and garden centres in the UK and elsewhere. To find out where to obtain this award-winning winter-flowering heather, The Heather Society recommends the RHS Plantfinder. Flowers magenta shading to amethyst and purple; corolla to 7mm long and 4mm diameter; flower-spikes to 25mm across, approx. 65mm long; blooms from December to April. Evergreen foliage dark green. Dwarf shrub, spreading to 0.6m across, to 0.45m tall. Uses: in containers for patios; in mixed borders and rock-gardens; as ground-cover. Lime-tolerant.